1843. 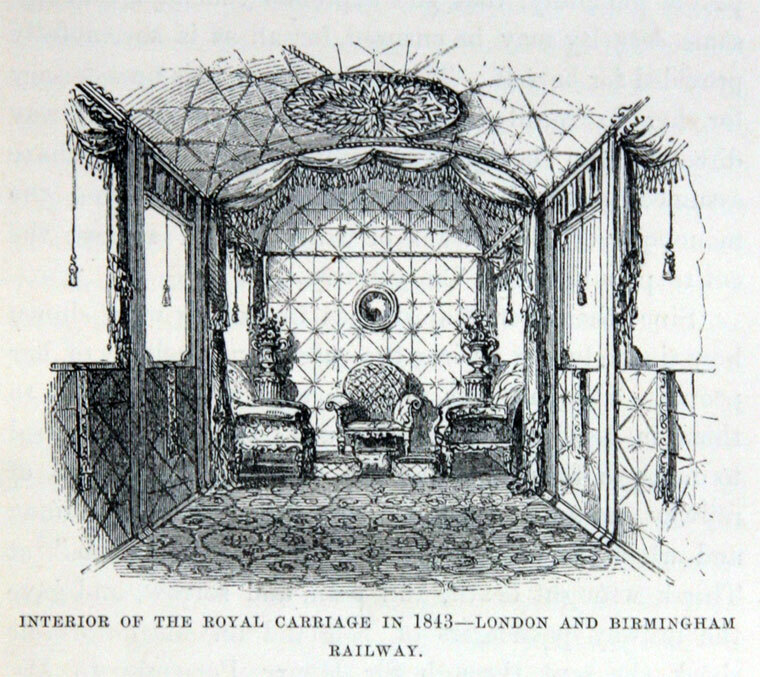 Interior of Royal Carriage. The London and Birmingham Railway (L&BR) was an early railway company in the United Kingdom from 1833 until 1846. The 112 mile long railway line that the company built between London and Birmingham was, when it opened in 1838, one of the first intercity railway lines in the world, and the first railway line to be built into London. It survives to the present today, as the southern section of the West Coast Main Line. The line was engineered by Robert Stephenson. It started at Euston Station in London, and travelled north-north-westward until reaching Rugby, where it turned west to Coventry and thence to Birmingham. In Birmingham the line terminated at Curzon Street Station, which it shared with the Grand Junction Railway (GJR), whose platforms were adjacent, thus providing a link to the Liverpool and Manchester Railway (L&MR), and allowing onward travel by rail from London to those cities. 1823 The idea of building a railway line from London to Birmingham had been mooted as early as 1823 when a company was formed by John Rennie to build such a line. Rennie proposed to build a line between the two cities via Oxford and Banbury (the route later used by the Great Western Railway). Soon afterwards another rival company was formed by Francis Giles who proposed to build a line via the Watford Gap and Coventry. The two companies were unsuccessful in achieving backing for their schemes, and in the autumn of 1830 the two companies decided to combine their efforts. The joint company appointed Robert Stephenson as chief engineer, and he soon decided in favour of the route through Coventry, largely because he feared flooding from the River Thames at Oxford. 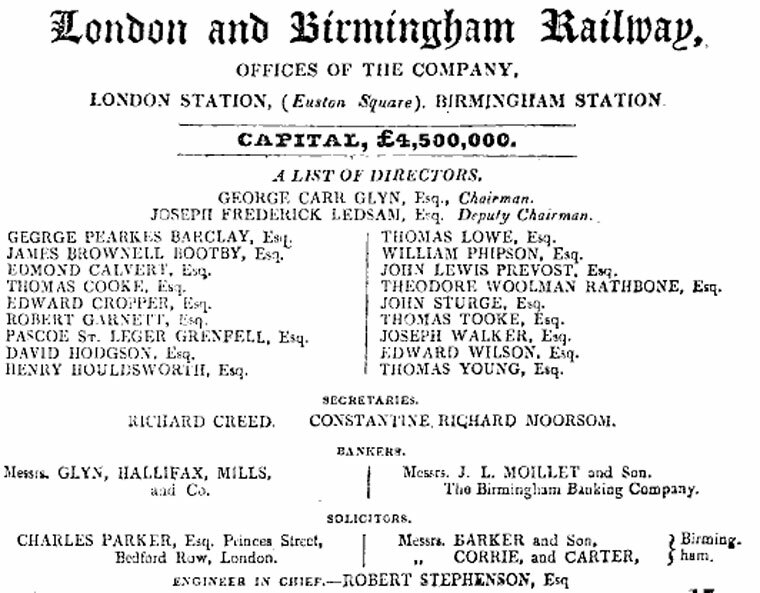 1830 See London and Birmingham Railway: 1830 List of Directors. 1833 The scheme was even more ambitious than that of the Grand Junction. It was authorised by 3 Will. IV., c. 36, 1833, but ought to have been sanctioned a year earlier. Euston to Boxmoor, on July 20th, 1837. Boxmoor to Tring, on October 16th 1837. Tring to Denbigh Hall (1.5 miles north of Bletchley) and Birmingham to Rugby on April 9th, 1838. Denbigh Hall to Rugby on September 17th 1838. 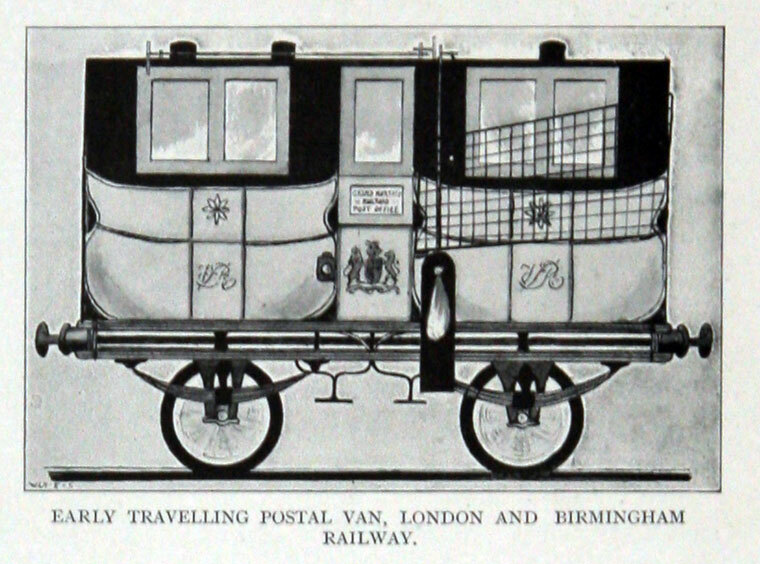 1838 The night mail from Euston was instituted and a mail-bag exchanging apparatus was fixed at Boxmoor. 1839 On June 10th 1839, the Aylesbury Railway was opened. It was sanctioned in 1836 and ran from Aylesbury to Cheddington on the London and Birmingham, and was worked by that company, but in 1846 was purchased by the London and North Western Railway. 1840 The line was 112.25 miles in length with stations at London, Harrow, Watford, Boxmoor, Berkhampstead, Tring, Aylesbury, Leighton, Bletchley, Wolverton, Roade, Blisworth, Weedon, Crick, Rugby, Brandon, Coventry, Hampton and Birmingham. The 8:00am train stopped at all stations and arrived in Birmingham at 2pm, a journey time of six hours. The fastest trains with limited stops still took five and a half hours. The trains all stopped at Wolverton for a ten minute refreshment break. Fares for the total journey ranged from 32s 6d to 20s for a one-way fare. No smoking was allowed in the carriages or the stations. This page was last edited on 18 February 2015, at 14:20.